Poll topper in Killaloe area Joe Cooney is congratulated by Fine Gael TD Joe Carey during the election count at The West county Hotel, Ennis. Photograph by John Kelly. Results are in for the Killaloe Electoral Area first count. 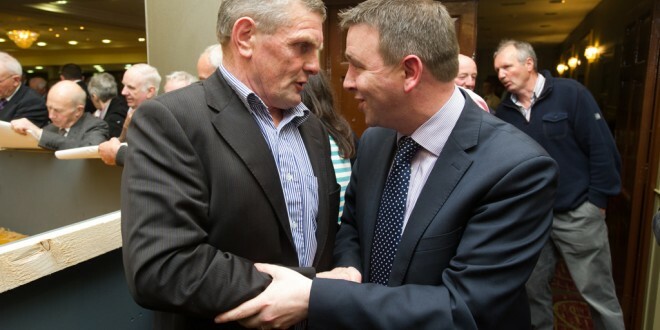 Joe Cooney (FG) has been comfortably elected having netted nearly 26% of the valid poll with a vote of 2,843. The quota was set at 1,585 votes, and Pat Hayes (FF) is just shy of the quota on count one with 1,490. Behind him is Michael Begley (NP) on 1,390. Tony O’Brien (FF) looks set to secure a seat with 1,294 votes. With Councillor Cooney’s surplus of 1,258 now being counted he expects his party colleagues Pat Burke (FG) and Joe Arkins (FG) to see the most benefit from it. Pat Burke currently stands at 825, and Joe Arkins at 755. The other results in show Alan O’Callaghan (FF) on 791 votes; Liam Wiley (FF) on 651; Niamh O’Brien (FN) on 731; and Donal Higgins (Lab) on 323. The valid poll in the electoral area stood at 11,181 polled, 11,093 votes were deemed valid.